Since his debut in 1959, Igor Kipnis has become one of the world's best-known harpsichordists, with more than fifty solo recordings in his discography. He has also performed and recorded on the antique fortepiano. Readers of the many magazines for which he has written will also know of his long-standing interest in romantic piano literature and its great performers. In 1995, Kipnis heard Karen Kushner's acclaimed recordings of the Chopin Mazurkas, released by Connoisseur Society. Shortly afterward the two met and expressed their admiration for each others' playing. They made their debut as a performing Duo later that year, and have since performed in in more than a dozen states and in Europe and South America. The recordings on the debut CD, entitled "Four Hands," derive from these performances. The rare performance ofBrahms's Liebeslieder Waltzes, Op. 52, in the composer's own version for piano four hands without vocal soloists, was played in Pittsburgh in 1998 and recorded by WQED-FM. Schubert's Divertissement à l'hongroise and Ravel's Ma mère l'oye were recorded in 1997 by WQXR-FM in New York. The Ravel, recorded for the first time with the composer's complete score, was the first music the Duo had performed together. Souvenirs de Beyreuth, a parodistic Wagner pastiche by Gabriel Fauré and André Messager, comes from the same WQXR concert . Calimerio Soares' Batuccata was written as an encore for the Duo to perform during a tour of Brazil. It was recorded on the Bösendorfer 275-SE Computer Grand, a system which records the position of each key 800 times per second and can thus reproduce the pianist's individual tonal qualities. 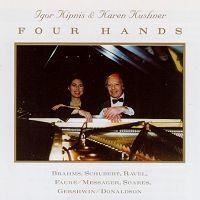 Finally, the Rialto Ripples by George Gershwin and Will Donaldson is recorded for the first time in an arrangement for piano four hands by Walden Hughes, in a performance from the Sundays at Four series at the Los Angeles County Museum of Art. This CD, which was produced in collaboration with WMHT/WRHV-FM in Schenectady, New York, contains 76 minutes of music. More information about the Duo can be found on the Duo section of Igor Kipnis´s website, http://people.mags.net/kipnis.